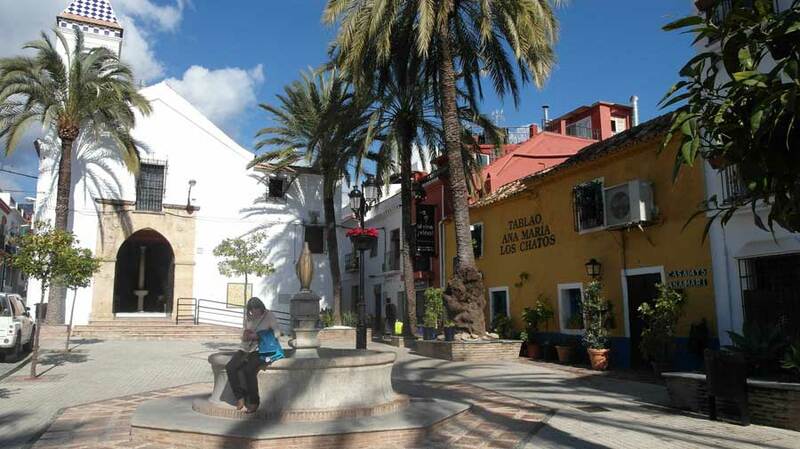 Marbella’s old town center around the charming Plaza de los Naranjos (Orange Square), with beautiful trees and exotic tropical plants, which features a wide variety of traditional Spanish and modern international restaurants. The charming fountain in the Orange square was built in 1604 and the famous square is also home to the original town hall, built in 1572. It is well known for its beautiful Mudejar-style door with detailed coat-of-arms and inscriptions. The charming maze of tiny streets in the old town is filled with rich history and is divided into two mayor areas, el Barrio Alto and el Barrio Nuevo. Other important roman landmarks in Marbella are the Vaults (Las Bóvedas), the ‘Villa Romana de Rio Verde’, ‘Basilica Vega del Mar’, and the Church of the Incarnation (Iglesia Mayor de la Encarnación). 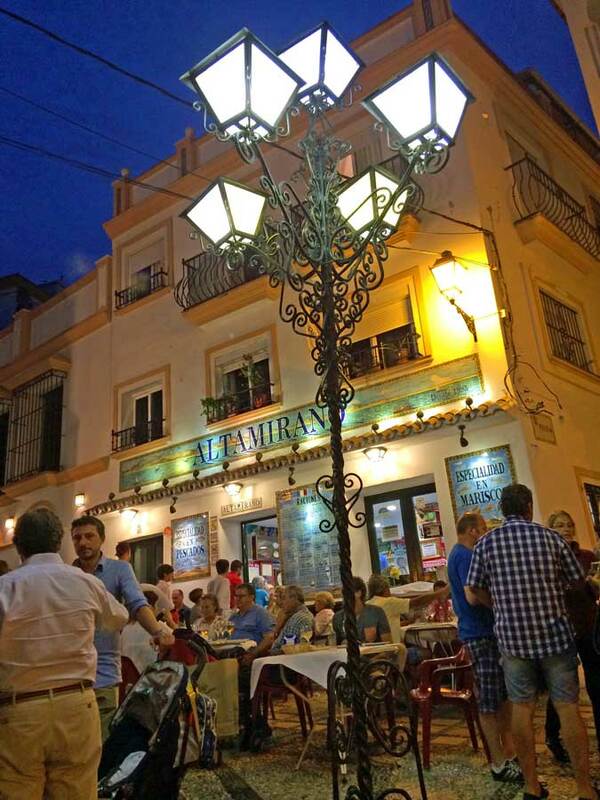 The old town is always lively and filled with small picturesque café’s, bistros and Spanish football bar’s and it’s a hub of activity day and night. 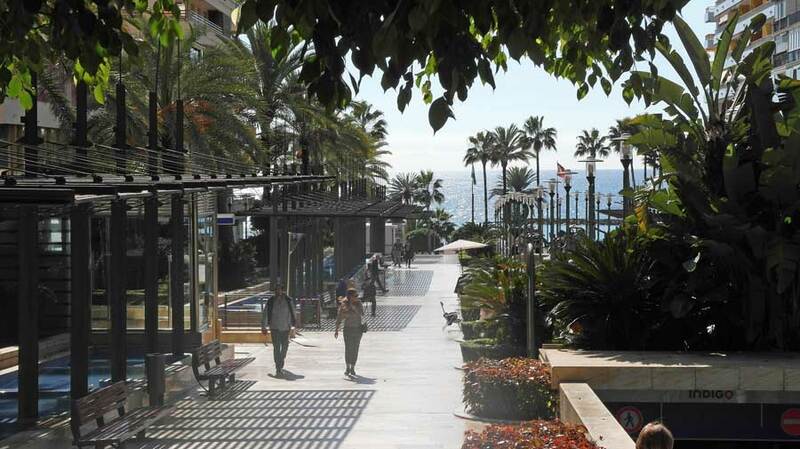 The narrow streets are lined with stately buildings and charming typical Spanish property, small shops, art galleries, boutiques selling everything from Moroccan rugs to summer sandals and designer names such as Versace, Gucci, Hugo Boss and Escada is to be found. If you leave the old town and get to Marbella´s main street, Ricardo Soriano there you can find much more of everything. The old town of Marbella includes the ancient city walls and the two historical suburbs of the city, the Barrio Alto, which extends north, and the Barrio Nuevo, located to the east. The ancient walled city retains nearly the same layout as in the 16th century. 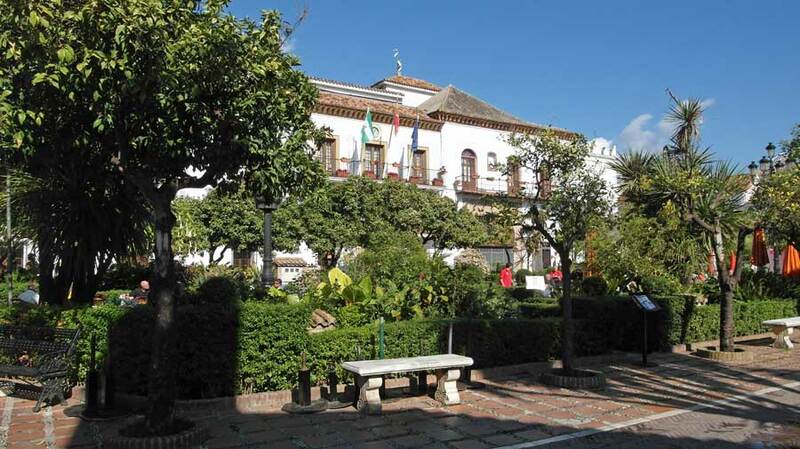 Here is the Plaza de los Naranjos, an example of Castilian Renaissance design, its plan laid out in the heart of Old Town after the Christian Reconquista. Around the square are arranged three remarkable buildings: the town hall, built in 1568 by the Catholic Monarchs in Renaissance style, the Mayor’s house, which combines Gothic and Renaissance elements in its facade, with a roof of Mudejar style and fresco murals inside, and the Chapel of Santiago, the oldest religious building in the city, built earlier than the square and not aligned with it, believed to date from the 15th century. Other buildings of interest in the center are the Church of Santa María de la Encarnación, built in the Baroque style starting in 1618, the Casa del Roque, and the remains of the Arabic castle and defensive walls; also in the Renaissance style are the Capilla de San Juan de Dios (Chapel of St. John of God), the Hospital Real de la Misericordia (Royal Hospital of Mercy) and the Hospital Bazán which now houses the Museum of Contemporary Spanish Engravings. One of the highlights of the Barrio Alto is the Ermita del Santo Cristo de la Vera Cruz (Hermitage of the Holy Christ of the True Cross), built in the 15th century and enlarged in the eighteenth century, which consists of a square tower with a roof covered by glazed ceramic tiles. The Barrio Alto is also known as the San Francisco neighborhood, after a Franciscan convent formerly located there. The Nuevo Barrio (New Town), separated from the walled city by the Arroyo de la Represa, has no monumental buildings but retains its original layout and much of its character in the simple whitewashed houses with their tiled roofs and exposed wooden beams, orchards and small corrals.